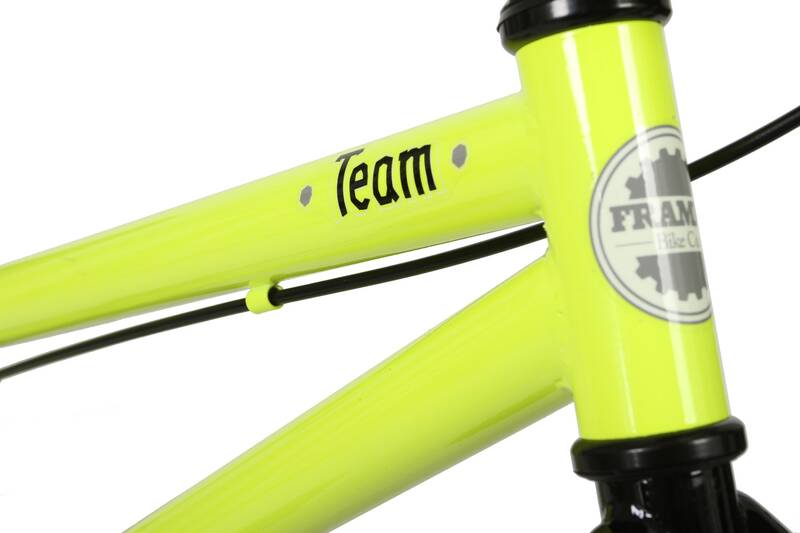 The Framed Team was built under the concept that a BMX bike can be solid, uncomplicated, and fun to ride. We say you can have a team bike that's not full Chromo. We say you can have a simple inexpensive bike that can hold its own. We say the Framed Team is that bike! Fork: Hi-Ten Steel; 1 1/8"
Handlebar: Framed Hi-Ten Steel 2 Piece 8" X 28"
I enjoy this bike and don't regret getting it. The only thing I'm not a fan of is wheel nuts are different sizes. It would be nice if the kept it the same as the rear 3/4 but it's just a beginner bike. It is nice and light, took it to the park on a nice day 45 degrees and there was a lot of grip and easy to maneuver. At $180 you get what you paid for. GREAT BIKE FOR THE MONEY!!!!! Brakes are a little hard for her to pull though. the bike is awesome light weight easy to ride. i have no complaints about my purchase what so ever. i would defently order again. I am impressed with this bike, I bought both colors and style, one for me and the other for my lady. You could tell by the photographs online that the bikes were designed and built well. Many reviewers state the same thing, “I feel like a kid again”, man is this true!! I couldn’t be happier, I wish I had this bike when I was a kid, it’s light, fast and looks sharp! While cruising around I effortlessly was able to bunny hop and pop wheelies with confidence! I bought the yellow for my other have and black with white for myself, I only had to some modifications(by choice) such as; a longer seat post(stock one is too short for me), pivotal seat, new pedals(I wanted white to match color theme, was a matter of preference, not necessity) and some white pegs, but I’m having a difficult time getting the rear wheel off(I feel this is due to the fact they tightened it real good or I’m back to be a rookie on bikes). Overall ecstatic about my purchase, many people tried to say not to get a bmx, but that’s been my style and currently still is! I look forward to being back into biking! I also bought us helmets for safety, as I feel is necessary. In the near future I will be buying a youth framed bmx bike for our little guy as he progresses and perfects the hobby. 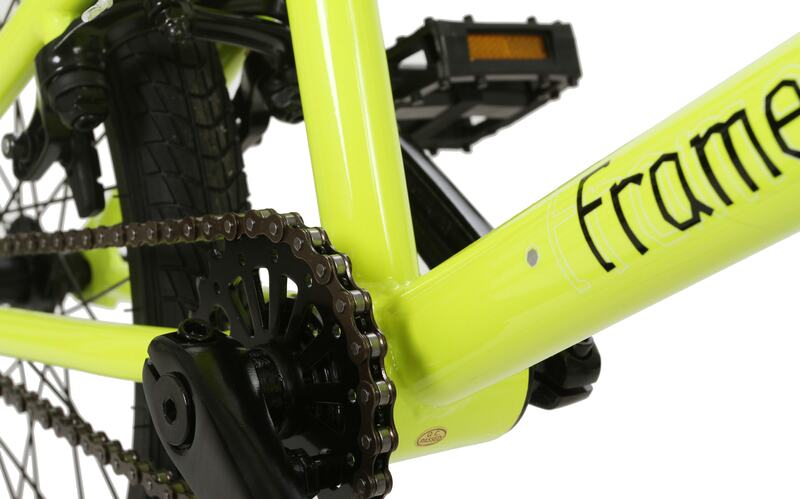 Framed is a solid company and I plan to recommend to anyone I know looking for a bike or wanting to get back into it! @ The House, you guys have great customer service and products arrived as promised at a good price, thank you! Wow, this place is awesome! Wow, this place is awesome! We always look for biz's worthy of our biz and this is one of them. I was shocked how thorough they were. How pleasant the operators were and even how they caught a shipping error (i typed wrong zip) before i did, corrected it, Emailed me and confirmed the changes just hours after my online order. The bike was a birthday gift and time was short for making it before his birthday... And they cared!! Holy smokes was i impressed. I like the bike style and color. We purchase this for my 13 year old son. We look at the reviews online and all was good. He likes the look of the bike. I will post a review after we receive the bike. It's a good bike at a great price. My grandson requested a fit bike for Christmas and selected this one. 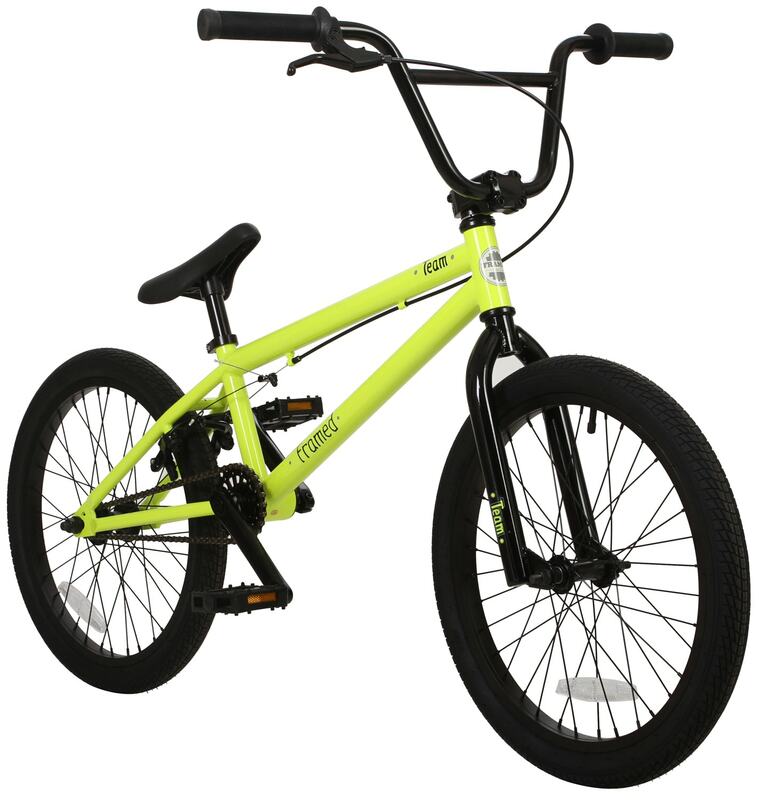 Lowest price on a 3-pc crank BMX bike. This bike has a lot of good reviews and I bought it for my daughter who is just starting out with bmx freestyle. This is considered the beginner bike. Seemed like a cool bike for a good value. Customer service was very helpful in securing my decision. What is the weight Limit And are those stickers and if they are can you take off them and can pegs fit? does this have a free coaster or cassette hub? is this bike good for skateparks jumps and bowls? 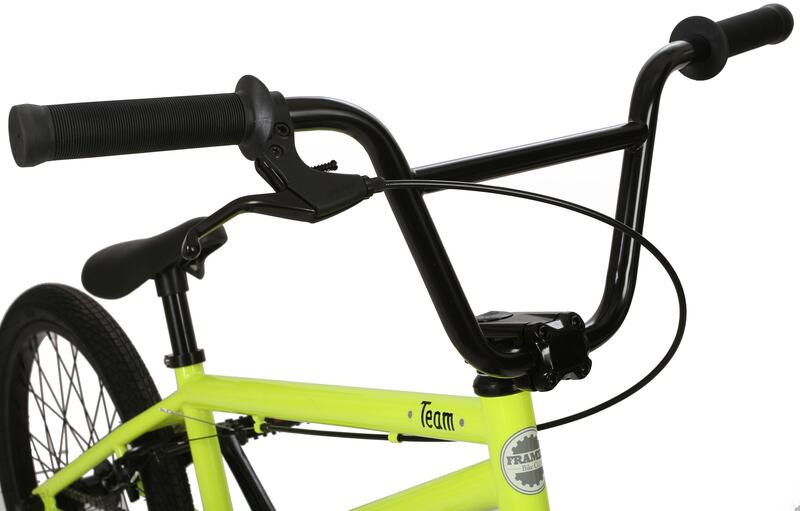 The Framed Team BMX bike is fairly simple in construction. It will be great for cruising and some street freestyle. For more park focused riding, I would look at something with a Chromoly frame. http://www.the-house.com/qfrattl20bkb13zz-framed-bmx-bikes.html For extremely robust bikes, look at Subrosa and Wethepeople bikes. I'm in Ohio but my son is North Carolina. I was informed that you only ship to dealers and they must sell your BOX bikes.. there is only one in NC 10 min from his house.. they apparently don't sell your BMX. How exactly can I get him a bike??? It's his on ;) y mode of transportation!!??????? Slow down a tic. I am happy to help! We can ship anything on our website to anywhere in the country. Not dealers. Select any BMX bike we sell! Let me know if you need help. Does this bike have a pedal brake or hand brake only? 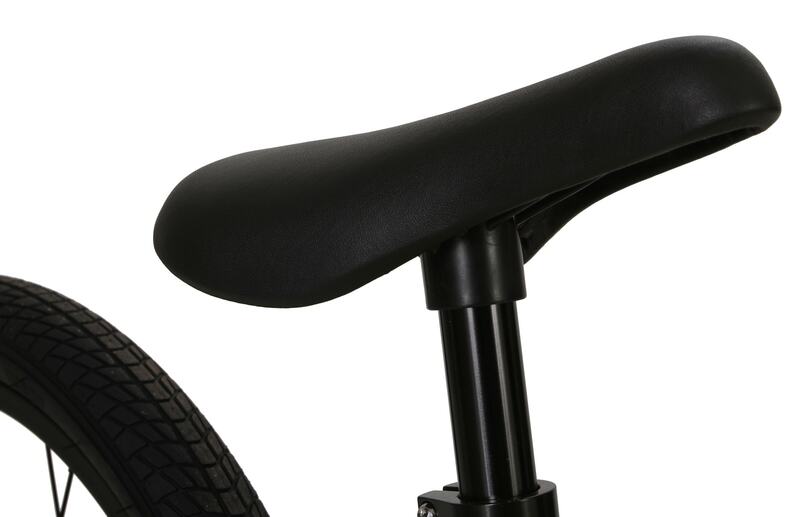 BEST ANSWER: It comes with a hand brake which is already installed on the bike. There are only few pieces to assemble. It has a hand brake only. Do they come assembled? Do they make a loud ticking noise like custom bmx bikes? BEST ANSWER: Easily assembled. Tools are household type. The "clicking" noise? Is because it has a free-wheel back hub, no pedal brake like Department store bikes. This is my sons 2nd Framed bike, he rides to school everyday on it. It comes partially assembled. The front wheel, handlebar and pedals, need to be installed. What tools do I need to assembly the bike? BEST ANSWER: The bike comes mostly assembled. It comes with the Allen wrenches. Just have a socket set and a wrench set for the front tire. I got mine a month ago and had it together in 15min. Just use elbow grease to keep everything from slipping. what age would you say this bike is good for? BEST ANSWER: Not sure age is the key factor... It is more height/weight. I'm 40 yrs old (5'9" & 175lbs). 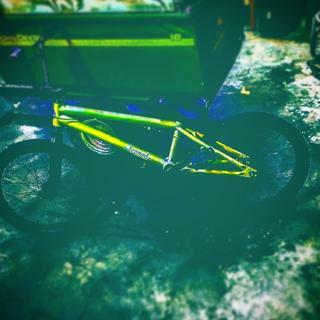 This is a perfect starter BMX bike for me. I'll pass it on to my son when he's big enough to ride a bike with a 21.5" top tube and 20" wheels. BEST ANSWER: I don't know much about bikes ... But got this for my 12 year old . He loves it. Rides to school and is learning the ins and outs of the skate park. I picked it because it was affordable and previous reviews stated that it was an excellent starter bike. Thanks for the answers everyone. 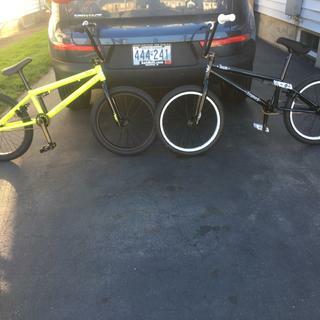 The Team is a solid deal on an entry level BMX bike. It's basic components and Hi-Ten frame will not be ideal for aggressive park riding. For cruising the streets and learning some tricks.. it is excellent. What is the weigh limi for this bike? 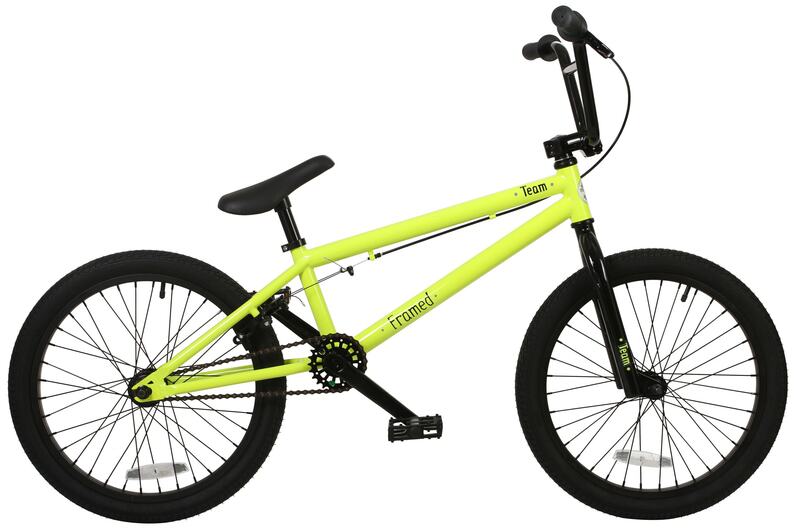 Is this a good bike for the skate park? Todd's answer is great. For a novice through beginner rider, it will be great. For aggressive and more advanced park riding you will want to look for a bike with the next level of components and a Chromoly frame. Im about 140 pounds and i see in the answered section of the questions that the weight limit is 200 and another person said it was 150 so if i could get a clear answer on the weight limit? Sorry for any confusion here. The weight limit of a BMX bike will depend on whether you intend to use it for freestyle tricks or just to cruise around on. Also, Framed initially posted one weight suggestion, but then revised it more recently. To clarify any confusion, Framed suggests that the weight ceiling for using this bike for freestyle riding is around: 150lbs...... and for cruising around: 200lbs. Is this a freecoaster or cassette. Also does it have a loud hub? BEST ANSWER: Thanks for the answers. Grandson on vacation and will return this weekend. Will have him answer this question. freecoaster and yes it has a loud hub. Does it come with pegs? BEST ANSWER: Hi.....no. Any of the bikes that come with pegs will clearly state that in the specs. 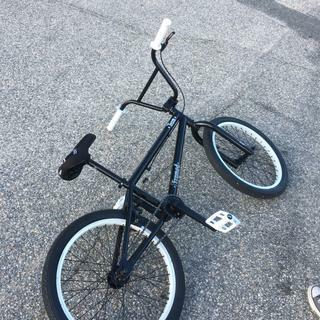 Hi I am 14 135 lbs and looking for a bike that I can ride at the skate park and it not break on me/break my pocket, is this the bike I should get? My 12 year old son loves it. He is a beginner so it would depend on your ability. I don't know much about bmx bikes so that is a much as I can help. My thought in buying it was: he can learn to ride this bike and beat it up, then if he develops skill we get him an upgrade...if we need to. My 14 year old son loves this bike. He highly recommends it! Im 15 going on 16 in about a week and im about 5'10 and 140 pounds and im looking for a first bike but know nothing about them, is this a good bike that would be suggested for me to buy? thanks. 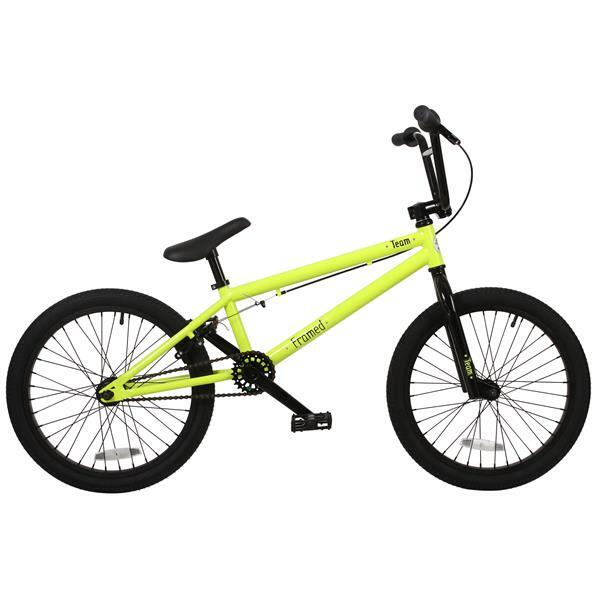 This is a good simple entry level BMX bike to ride the streets and learn some basic tricks with. It will not be ideal for use in a skate park or for aggressive jumping. Absolutely bang for buck it's a really good bike would be a great first bike for youEnter an answer to this question. When you buy it is it already built? Kelly's answer is good..... The bike will arrive 3/4th assembled. Some final assembly will be required, and more importantly..... alignment. can an eight year old ride it? Age is an impossible way to judge weather or not a bike will be good. It will depend on how tall he is. For most 8 year olds it will be a little big. Yes I think he or she can. My son is 11 but he is small and he can ride it. what size is this bike? BEST ANSWER: 20 inch. My daughter is 5'6 and loves this bike. We originally ordered the black and white but was shipped the yellow and black. At first she did not like it but now she loves it. Its a good bike for the price. can the seat go lower than the picture? The seat on this Framed Team BMX bike can go a little lower than pictured. How easy can this be assembled? BEST ANSWER: About 20 min with "proper" tools. Allen wrenches sent with worked good, but need a couple wrenches to do pedals, front tire. Easily accomplished. A pair of wire cutters for all the zip tied protective cardboard, and parts connected for shipping help speed the process. Can a kid use this bike? I have a 10 year old boy. They are right, it's not a hard job. You'll have to assemble the pedals, the front tire, the seat and the handlebars. Nothing too complicated. It's not hard at all. Although to validate the warranty, they ask that you have the bike professionally assembled. Hello I'm 13 about to turn 14 and 130lbs is this a good bike to ride around the neighborhood and learn to do starter tricks? If you are around 5' or taller this Team bike will be excellent for riding around the neighborhood and learning basic tricks. im 4"8 and 100 pounds should i get 20" or 18"? That is tough as you are between sizes. Technically the best for you is the 18", however if you are growing a standard 20" BMX bike will be the best option in no time. When you y the bike is it just the or the whole bike? 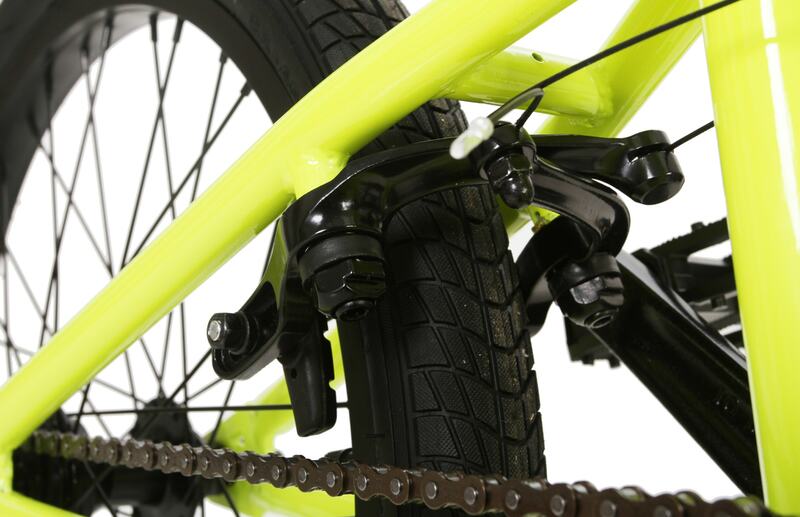 This is a complete bike with wheels, tires and components. Is the bottom bracket sealed? The bottom bracket on this Framed Team BMX bike is an Unsealed American. Does this bike have a gyro? This Framed Team bike does not have a gyro or gyro mounting tabs. Do the bikes come assembled? BEST ANSWER: No, it did not come assembled. But, my 12 year old was able to put it together on his own, so it isn't difficult with a few simple tools.